Having the opportunity to play hockey in Japan was a career-changing event for Guy Charron. Just because the regular season is over doesn't mean players from non-playoff teams are on vacation. Some players take part in the IIHF World Championships, while younger players may end up in the AHL playoffs. In April 1976, two second-year expansion teams got a taste of postseason hockey in Japan. The Kansas City Scouts took on the Washington Capitals in a four-game series in Tokyo and Sapporo. It would be the final games the Kansas City Scouts would play as the franchise was sold to Denver interests and was then moved to the Mile High City. The Caps, who had finished the regular season at the bottom of the Wales Conference, beat the Scouts, the worst team in the Campbell Conference, three games to one. Meanwhile, Washington coach Tommy McVie was interested in one Kansas City player -- Guy Charron. "Whether it was a promotional thing, basically the two teams they selected to go to Japan had to be pretty well out of the playoffs by a certain time," Charron said. "Being two expansion teams by January, February we pretty well knew that we weren't going to make the playoffs, so therefore there was a lot work to be done for passports and things like that. I am assuming that it was a promotional thing by the NHL to Japanese hockey. I think it was the first time the NHL ever went to Japan." Charron was a good player with a bad team. He scored 27 goals and had 71 points with the Scouts in a bounce-back year after scoring just 14 goals and 53 points the year before with Detroit and Kansas City. 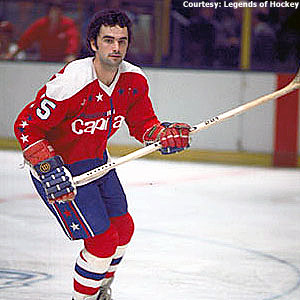 His play caught McVie's eye, and he decided in Japan that he needed Charron on the Caps in 1976-77. Charron signed with Washington as a free agent on September 1, 1976. Charron and the Scouts ended up in Japan because they were a bad hockey team. McVie and the Capitals found there way to the Land of the Rising Sun the same way. Washington was a terrible team. Kansas City easily qualified for the Japanese trip by going on 27-game winless streak during the 1975-76 season. Hockey players who are playing in April are generally playing high-stakes hockey. The Caps-Scouts series was not a high-stakes tournament, and that allowed everyone to soak up some Japanese culture, including sumo wrestling. The Kansas City Scouts franchise was originally named the "MO-Hawks" in a marketing effort to reflect the two states in the Kansas City metropolitan area, Missouri and Kansas. The MO for Missouri and Hawks for the Kansas Jayhawks side. The team name was rejected by the NHL and Chicago Blackhawks. The Scouts nickname came from the Kansas City "Scout" statue in Penn Valley Park that overlooks Kansas City, and the team logo bore the image of the Scout statue. There was a Kansas City Mohawks team which lasted two years, between 1949 and 1951, that played in the United States Hockey League. Kansas City and Washington were granted NHL franchises on June 9, 1972. Kansas City earned its first home victory by defeating Washington 5-4 on Nov. 3, 1974, so there was a lot of history between the teams by the time they got to Japan. Kansas City was 15-54-11 with 41 points in the team's inaugural season and slipped to 12-56-12 and 36 points in 1975-76. Japan received two NHL teams for four games, but they didn't get to see the Montreal Canadiens or the Philadelphia Flyers or the Boston Bruins, the top teams of those days. They saw two expansion teams who were struggling to be competitive. "Well, an expansion team is never easy," said Charron. "Unfortunately, there are times when you change too many things. All the players, they know what situation they are in, they want to make the best of it and the same thing for coaches. But it is hard on everyone because sometimes you play well enough but the talent can't prevail, the other teams have more talent and you end up losing a lot of games where you fought really hard and at the end the outcome was a loss. Consequently what it does, it brings down everybody after the course of the season." So going to Japan for Charron was a career-changing event, and under McVie, Charron had a career year in 1976-77, registering 36 goals and 82 points. The next season, he scored 38 goals. Charron never played in an NHL playoff game, though, during his career with the Red Wings, Scouts and Capitals, so his only chance to shine in April came in Japan. Kansas City never played an April playoff game. The Colorado Rockies made the playoffs in 1977-78, but lost in a best-of-three series 2-0 to Philadelphia. The Scouts-Rockies became the New Jersey Devils in 1982, but it was not until 1988 that the franchise returned to the playoffs. New Jersey has won three Stanley Cups and played a lot of meaningful April games.